Virtual reality is a modern technology that has exploded in popularity in the recent year or so. It’s not just a single-minded technology either. Even though it is commonly linked to gaming and movies, it has uses that are wide-ranging and nearly limitless. It is only a matter of time before we see strange intersections of virtual reality and other technologies. One such strange intersection, it would seem, is that of virtual reality and cryptocurrency. Cryptocurrencies have become a global phenomenon. Ask anyone about Bitcoin for example, and they’ll have some vague idea about it. Despite the immense popularity that cryptocurrency currently enjoys, no one really understands the technology behind it. Despite its apparent emergence in recent years, the idea of digital currency isn’t new at all. There were even attempts at creating digital currency in the 90’s, but they all failed due to a lack of interest. The current cryptocurrency boom owes its popularity to Bitcoin. Bitcoin, the king of current cryptocurrencies, was created invented by Satoshi Nakamoto in late 2008. Satoshi wanted to create what he called a “peer-to-peer electronic cash system”. The intricate workings of cryptocurrency are very technical and hard to understand, even for very technical people. Digital currency exists in a digital payment that comprises of accounts, balances and transactions. A person in possession of digital currency should spend it only once. But what’s to prevent the same person from making a copy of the currency and use it again? That’s where the concept of verifying transactions comes from. Since modern digital cash is based on peer-to-peer networking, computers are working round the clock, verifying transactions from different users. The verifications are carried out to make sure that a piece of digital cash is spent only once, and in case of cryptocurrency, the verification comes from the blockchain technology. 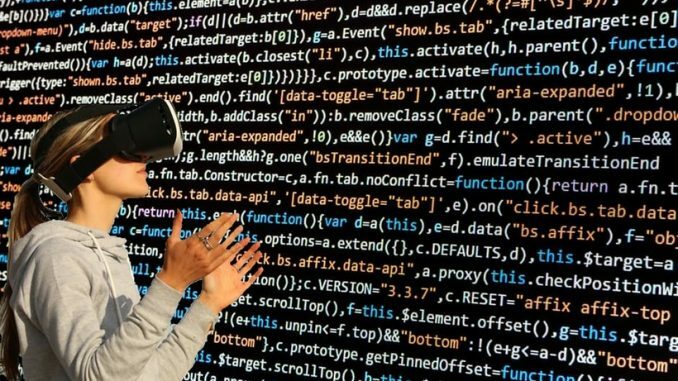 Virtual reality and cryptocurrency are both popular modern technologies. Both have countless uses and advantages. So can their unique benefits and uses be combined to create something even more exciting? Some companies have already started to look into the ways that VR and cryptocurrency can come together. In this article, we’ll be exploring these companies and what they’re trying to accomplish. Decentraland is a project that aims to attract users by letting them create digital land and objects in its virtual space. We’ve seen this concept before with SecondLife, but that’s where the similarities end. Instead of relying on conventional money, Decentraland will depend on cryptocurrency. Space in the Decentraland’s virtual world can be bought in 10×10 blocks, with one such block costing 1000 MANA tokens. MANA tokens are the digital currency which will be used for purchasing land in Decentraland. The team behind it has also been successful in raising nearly $25 million through crowdfunding. The crowdfunding resulted in the distribution of MANA tokens to the backers of the crowdfunding campaign. The creators of Decentraland hope to create a whole digital land economy, where people will offer specialised services in exchange for the cryptocurrency. In a nutshell, VibeHub is a marketplace for augmented reality and virtual reality which will be powered by cryptocurrency. The creators of VibeHub aim to get service providers onboard the service. These service providers could be virtually anyone – celebrities, music teachers, public figures, therapists and so on. It’s a novel way of using virtual reality, and indeed a unique idea of using cryptocurrency. It promotes communication between people who might not have been to communicate in normal conditions. Imagine having the opportunity of getting a session with your favourite musician or athlete, for a fee in cryptocurrency of course. The experience is sure to be better than a simple voice chat session as virtual reality brings its level of immersion that is not possible via traditional means of digital communication. To support the platform, VibeHub has come up with its blockchain-powered cryptocurrency called the ERC20 token. Voxelus is an online platform which allows anyone in the world to create and share virtual reality games without writing a single line of code. This is made possible through Voxelus’ library of assets that can be used to create simple platform virtual reality games. Users can, of course, charge money for their creations, and this is where Voxelus is aiming to do something different. The currency on Voxelus’ platform will be the Voxel coin; a cryptocurrency made especially for the Voxelus Platform. Using the Voxel coin, users will be able to purchase or sell games. If you’re a game creator who wants to earn Voxels on the platform but is unsure about its real-world value, then rest assured because they can be traded on popular cryptocurrency exchanges such as ShapeShift, Poloniex and Bitfinex, among others. Voxelus is doing something new here. It lets anyone create virtual reality games without knowing programming. So anyone with an idea for a VR game can go ahead and make it a reality. Not only that, the Voxelus Platform will allow such people to reach a broad audience that can view their product and buy it. It’s certainly a promising concept. With time, as we see more intricate marketplaces crop up in virtual reality spaces, the use of cryptocurrency in virtual reality will spike as well. Cryptocurrency seems like a natural fit for virtual reality because different marketplaces can have their currency rather than conventional money. And if you’re interested in more ways of how VR be used, check other virtual reality experiences to look forward to.